Social networking with Twitter can be a lot of fun. So much fun, in fact, that it can verge on being addictive. We say, why not feed that addiction?! With a Twitter app on your smartphone you can easily keep up to date with what is going on out there in that strange, 140-character world. 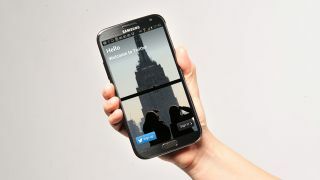 And, of course, if you really want to be a Twitter power user then a Samsung GALAXY Note II is the perfect social networking companion. The official Twitter app for Android lacks some of the more advanced features like user 'muting' or scheduled tweets found in other apps (of which more later) but it is guaranteed to get all the latest official features first. For this reason alone it is worth keeping a copy installed and updating it regularly. That said, a power user is going to feel a bit constrained by the official app fairly quickly. Luckily, the Google Play store is packed with alternatives. Two of the best are Ubersocial and Twicca. Ubersocial is a Twitter client packed with features and innovative twists on the standard formula. The app supports multiple accounts, simultaneous updates to Facebook and a unique 'inner circle' tab that just shows updates from a select group of friends. The app's ability to preview media 'inline' without calling a separate viewer is equal to the official app, and for our money, even better. Twicca is a decidedly minimalist app but one that consistently scores highly among power users. What it lacks in smooth transitions and slick presentation it makes up for in speed and expandability. Twicca can be expanded with plug-ins (also downloadable from Google Play) that add features like URL shortening, automatic 'Now playing' tweets, draft tweets and more. The app will also let you colour code tweets by selected users so they stand out more. Slices is a rather different Twitter app that focuses on content discovery. It can organise your timeline into categories (or "slices") such as Workmates, Friends, Celebrities and so on. It can do this automatically or you can create your own Slices and assign people to them as you see fit. The Explore function of Slices will trawl through Twitter to show you interesting tweets on a variety of topics. It's a great way to see what is going on around the world and to find interesting new people to follow. When Twitter first started, users would post copies of tweets they liked prefixed by 'RT' for 'Retweet'. Twitter removed the ability to do this automatically from the official app in an attempt to force people to use its own Retweet function, which preserves the original tweet and is more useful for its own analytics. If you want to use the old-school method, Twitplus is a clever add-on can do the trick. Just share a tweet to it as if you were sending it to another app like GMail, etc. and it will put it into the correct format and send it back to the official app for uploading. It can also do automatic translations of foreign language tweets and a few other tricks. Dead handy. One of the signs of Twitter addiction is a sudden obsession with how many followers you have. Tweet Followers is an elegant widget that will feed this obsession rather nicely. Just point the widget at your Twitter username and it will keep track of your follower count. You can track multiple accounts if you want, just assign a widget to each for as long as you have room on your home screens.